At Goley, our goal is to help you feel comfortable in your home while keeping your energy costs low. As a locally owned independent insulation contractor in St. Louis, the Goley team goes above and beyond to deliver. We regularly undergo vast training in building science and the latest energy-saving installation and auditing strategies. We meet and exceed IECC energy codes and work with area builders to find the best energy solutions for every project. Plus, we only install premium products from trusted manufacturers, like Owens Corning. Additionally, Goley Insulation is a proud member of the HBA Green Building Council and has participated in the construction of LEED, GBI and ENERGY STAR certified homes. Our goal is to help you feel comfortable in your home while keeping your energy costs low. Our staff includes Certified Green Professionals, BPI certified estimators, HERS raters, and Green Building Council members. We offer many solutions to a variety of problems whether it be a problem with your existing home or making your dream home look and perform the way you want. Our certified staff will look at your home with you and advise you on the ways we can make it more comfortable and energy efficient for you and your family. We strive to bring you products and services that keep up with current technology. Our staff stays educated in the areas of energy conservation so we can offer you cost effective solutions for your project. Being energy smart has huge advantages for everyone. By properly insulating and air sealing your home or commercial building, nonrenewable energy sources are conserved. The benefits of energy conservation are far reaching, including decreased dependence on foreign oil and lower greenhouse gas emissions. How Green are the products? We know that insulation helps conserve energy, but what about the insulation products themselves? Sustainability is key. The primary raw material used to make fiberglass insulation is sand, which is a rapidly renewable resource. Additionally, Owens Corning’s fiberglas insulation products average 35% recycled glass content. Icynene® spray foam does not contain synthetic blowing agents, which have very high global warming potential. Icynene® does not lose r-value over time and can potentially eliminate the need for installing additional insulating material in the future. Saving energy saves you money. The investment you make by properly insulating and air sealing will be evident in your energy bill. By adding insulation and air sealing, you are investing both in your comfort and the environment. Goley Insulation is a proud member of the HBA Green Building Council and has participated in the construction of LEED, GBI, and Energy Star certified homes whose primary focus is energy conservation and sustainability. Air sealing helps heated and cooled air stay inside your home by closing the gaps that leak air. Sealing your building envelope is comparable to closing a window before running the air conditioning. Beyond those easily spotted leaks, your home may have many other holes in its exterior that can’t be easily seen. Air leaks in attics, basements and crawlspaces are typically bigger problems and allow greater amounts of energy to escape. To understand how sealing air leaks improves your home’s performance, check out this video. A blower door is used to determine where the air leaks are throughout your home, paying special attention to the building envelope which is the home’s foundation, walls, ceiling, windows and doors. In addition to finding air leaks, the blower door will also assess the effectiveness of air sealing. 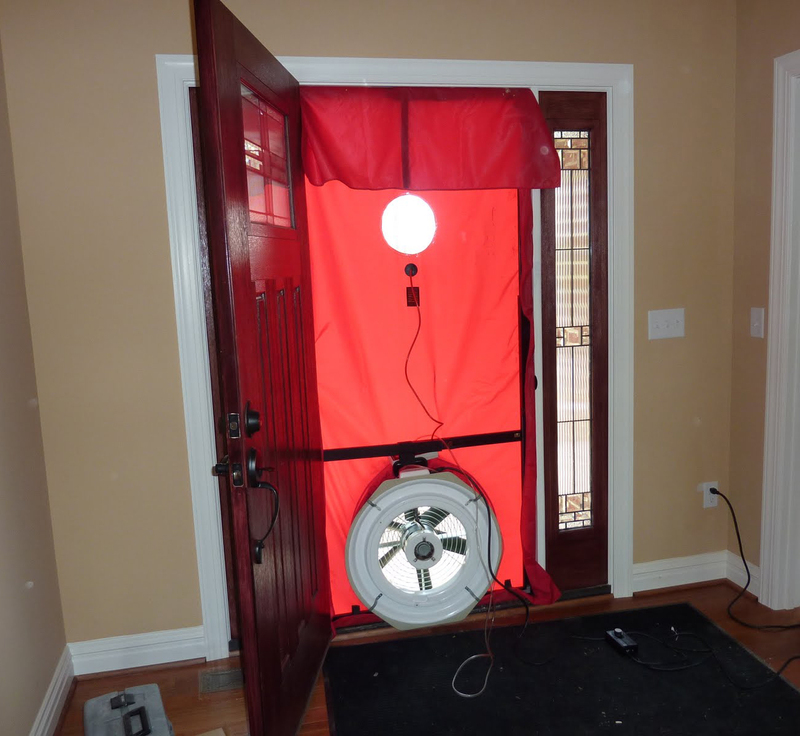 During the blower door test, our certified auditor mounts a powerful fan in an exterior door. The fan, when engaged, forcefully draws air out of the house, revealing cracks and crevices that are allowing air to infiltrate the home, resulting in inefficiency. Another great way to detect air leakage in the home is through infrared scanning. During an energy audit, we will come to your home and capture thermal images that detect cold spots and heat variations. This will visually show the areas that allow energy loss and need attention. These places may need additional insulation or air sealing. This method can be used in conjunction with a blower door test, which would exaggerate the areas of air infiltration throughout the building envelope. The quality of the insulation installed in the home is also put to the test with this device, along with the ability to check existing homes for a lack of insulation. If you have any questions about the integrity of your existing home’s insulation or would like to see how airtight your home is, please contact us to discuss your options. The following strategies are just a few ways Goley makes spaces more comfortable and energy efficient as part of a home energy audit. Contact us to schedule an energy audit today. Goley Insulation is proud to be a HERS Rater Partner. By teaming up with RESNET, we help builders and homebuyers realize the many benefits of building or buying an HERS Rated New Home. This is a home that meets specified guidelines for energy efficiency. To learn more the HERS program, contact Goley today.